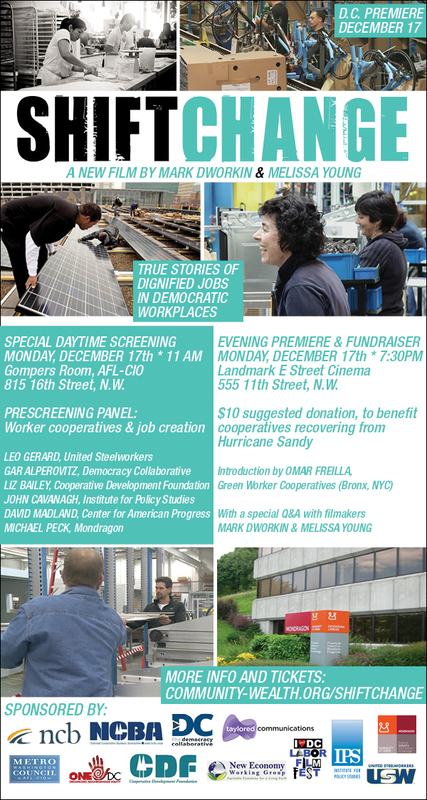 Shift Change: Putting Democracy to Work is a documentary film by veteran award-winning filmmakers Melissa Young and Mark Dworkin. It tells the little known stories of employee owned businesses that compete successfully in today’s economy while providing secure, dignified jobs in democratic workplaces. With the long decline in US manufacturing and today’s economic crisis, millions have been thrown out of work, and many are losing their homes. The usual economic solutions are not working, so some citizens and public officials are ready to think outside of the box, to reinvent our failing economy in order to restore long term community stability and a more egalitarian way of life. Mondragón Cooperative Corporation [MCC]: Begun in the 1950s, the Mondragón co-ops have transformed a depressed area of Spain into one of the most productive in Europe with a high standard of living and an egalitarian way of life. 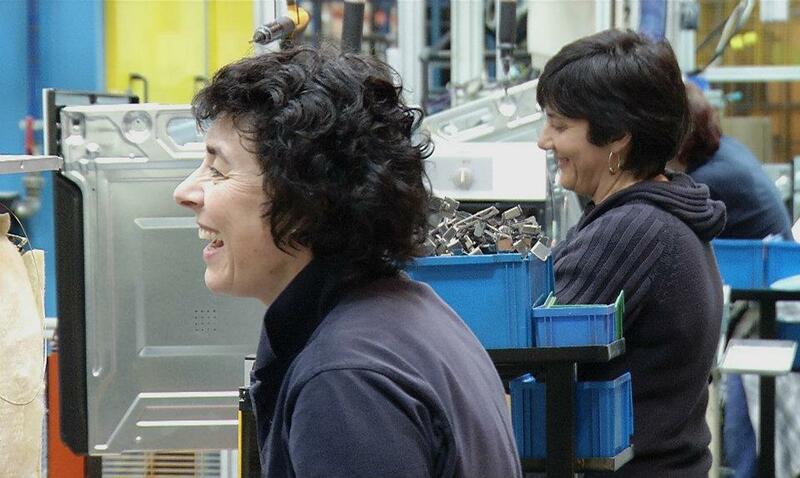 These co-ops produce computer chips, high tech industrial machinery, household appliances, and many other products. They are owned and managed by their workers. Seeing the achievements of the MCC helps to overcome the idea—widespread in North America—that worker run cooperatives can only exist on the economic fringe. The Evergreen Cooperatives in Cleveland, Ohio: This is an ambitious urban redevelopment model, directly inspired by Mondragón, where local institutions and public officials are supporting green cooperatives of previously marginalized, predominantly African American workers, who provide commercial laundry services, install solar energy systems, and grow vegetables in vast urban greenhouses. Arizmendi Association of Cooperatives, San Francisco, California: Started 30 years ago, there are now six of these independent worker owned and managed cooperative bakeries that work together to provide the financial and legal services they need, and to incubate new coop bakeries. Cooperatives of immigrant workers: Often the most marginalized in our current economic system, immigrant workers are starting cooperatives to create secure, environmentally friendly jobs. The non-profit WAGES helps low income women, largely Latina immigrants, organize green house-cleaning cooperatives in the San Francisco Bay Area. Isthmus Engineering and Manufacturing in Madison, WI: This proudly worker owned and managed company designs and builds custom high tech manufacturing equipment for the medical, automotive and energy industries. They have a strong commitment to improving solar technologies. They’ve joined with other longstanding coops in Madison, including Union Cab and Community Pharmacy, plus many others, to form a network of worker cooperatives that can support each other and encourage new cooperative businesses to form. Equal Exchange, Boston MA: Founded in 1986, Equal Exchange is one of the largest roasters of fair trade coffee in the world. Democratically managed by those who work there, Equal Exchange distributes coffee, tea, chocolate bars, cocoa, and snacks produced by cooperatives in the U.S. and other countries. The more than 100 worker owners seek to demonstrate through their successful business, how worker cooperatives and fair trade contribute to a more equitable, democratic and sustainable world. Moving Images, a non-profit production company, has been promoting global justice and environmental protection since the late 1980s. Moving Images’ films address some of the most severe contemporary problems while offering examples of proven solutions to guide and encourage viewers to work constructively for change. In collaboration with Moving Images, seasoned documentary producers Mark Dworkin and Melissa Young have produced a broad range of films on social and environmental issues. Previous productions of Young and Dworkin have won prestigious awards from CINE, Houston, Media That Matters, Chicago, NW Film and Video, Women in Film/Seattle, Prix Leonardo, International Wildlife Festivals and many others. These films are in broad circulation in academic and community settings and 5 have been broadcast nationally on PBS stations.